Using a Gas Stove is the classic method of cooking. It has been working for decades and it’s still a good choice for traditional cooking lovers. However, if you don’t buy the best cookware for gas stoves, you will end up wasting money and time on damaged pots and pans that can’t resist the flames. That’s why I’ve put together a list with the top 10 best pots and pans for gas stove that money can buy. But first… let’s see what you need to know before going into the market. 2 Why is it tricky to find the right cookware set? 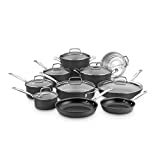 13 Which of all these sets is the best cookware set for gas stoves? 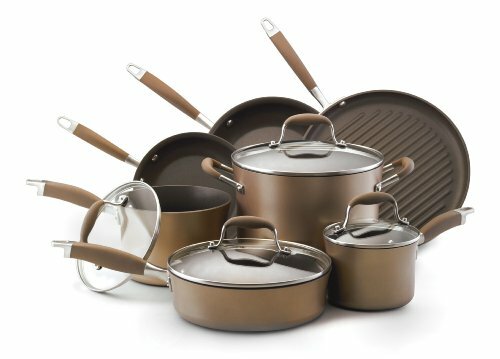 Why is it tricky to find the right cookware set? 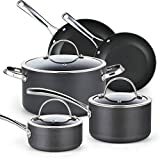 You can cook practically with any pan on a gas stove; the big deal is that the new non-stick pans usually get burned at the bottom, especially the ones that have bright colors on the exterior. After a few months, you could notice discoloration with the form of the flames. The trick to cook with a non-stick pan on a gas stove is to cook on medium heat. Remember that ceramic, for example, is an excellent heat conductor and retains the heat, so you can perfectly pre heat a little bit and then cook your meal in medium or lower heat. The gas stove is being slowly replaced by the electrical ones and more recently the induction cooktops. One of the reasons is the lack of energy efficiency. When you transfer the heat from the flames to the pan you lose a lot of energy because the flame tends to go up around the pot rather than heating the bottom. This cause cold spots on you pan, and you will have to move your meal to get an evenly finish. The principal characteristic that a pan has to have for gas stoves is a resistant and preferable stainless steel bottom. Also, it’s a good choice avoiding the pans with colorful exterior. Colorful pans last less with gas stoves, so purchasing a black one is advisable. This shouldn’t be a problem because usually the ceramic sets are inexpensive, for example the Cook N Home or Green Life products. It´s expensive and the set doesn’t include a good range of pieces. But there ‘s something that I can guarantee you 100%: This set will last forever. And if it doesn’t, well at least it comes with a lifetime warranty. The body is pure stainless steel. The interior has a matte finish and the exterior has a brushed texturized finish. This stands out the appealing look of the set. It looks classy and professional. The pans have a core aluminum that distributes heat evenly. The set is suitable with all cooking methods except induction. The package claims that it´s dishwasher safe but some consumers have reported some discoloration spots on the exterior surface after using dishwasher. 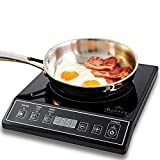 This is not completely non-stick because stainless steel doesn’t work as a ceramic coating but you can clean it without worrying about scratches, because this pans are resistant and well-made. 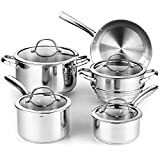 If your budget can´t afford the All Clad Master Chef, but you definitely want a set of stainless steel I highly recommend you to look over the Cooks Standard Cookware set. It is a high end set with the price of a medium gamma set- what else could you ask for? One of the features that I like of this set of pans is the technology called “impact bonding” that provides an evenly heating on the bottom of the pan. This is because they put an aluminum disc on the base of every piece of the set that retains and distribute the heat from the flames. For that reason it’s perfect for a gas stove. Also the cooking performance is flawless. The range of pots and pans is good. The set contains sauté pans, frying pans and stockpot. The lids are transparent and you can watch your meal while it is cooking. The pans are completely oven safe until 500F, but the lids aren´t oven safe. The handles are designed with an air-flow technology that keeps the handle cooler and more comfortable to hold when cooking on the stovetop. This set is made of hard anodized aluminum that is more resistance that stainless steel, and it’s less susceptible to scratches. These kinds of pans have a rough exterior that I wouldn’t recommend for ceramic-glass stoves, but for a gas stove it is just perfect. Another feature that I really like about this set is that the aluminum core is designed to heat up quickly. As I said at the beginning of the article, gas stoves aren´t energy efficient but with this set you can reduce the time it normally takes to heat a pan on a flame. The interior of these pans isn´t less interesting because it is made of quantanium nonstick reinforced with titanium. This is not a common coating. The first I have to say is that it’s non-stick and does its works. With the purpose of avoiding toxic fumes, I suggest not to overheat the pans. By the way the range of pieces of this set is ridiculous; you will fully equip your kitchen with this set. Every piece comes with a cover. Here it is another hard anodized set that makes it the most endurable of the market. What I adore of this set is the look. Most of hard anodize sets are boring and usually black. The bright and funny color palettes are reserved for ceramic. But this set is the exception. The color is a spectacular and elegant bronze. It matches with the soft handles in a light brown. The range of pieces is good. The handless are soft at touch but this doesn’t mean they aren’t oven safe. The handles can stand up to 400F. The lids complement the elegant look of the set. The lids are made from break-resistant glass that allows you to watch your meal while it is cooking. For those like me who love the ceramic sets not everything is lost. This is my all-time favorite. The GreenPan Rio mixes the best of two worlds. It has the roughness of a hard anodized body and the non-stick properties and safety of ceramic. It has all that you are looking for in a professional set of pans. The pans are dishwasher safe and oven safe. The internal coating is Thermolon non-stick ceramic, which I’ve mention millions of times here at The Cookware Geek as one of the top-class ceramic technology. There is nothing that I don’t like about this type of ceramic and this set in general. This 13-piece set has all the pieces needed for essential everyday cooking. All the pieces are made of stainless steel that retains its quality assuring that the pieces will still have that sleek, beautiful look for years to come. All pieces in the set have a multi-layered bottom. This means that within the steel base of the pan is a thick gauge aluminum core with a copper disk that prevents warping, and eliminates hot spots, which are one of the biggest problems I’ve encountered when cooking with a gas stove. Because of its multi-layered base, heat distribution on the pan is always perfect. Aside from having great heat distribution and a sleek look, all the pieces in the T-fal Cookware Set are dishwasher safe and oven safe of to 400. This allows a lot of versatility with the pieces in the set. The pieces also feature the TechnoResist Anti Warp technology, which completely prevents the pan from warping even when frequently cooking at high-heats. The T-fal Cookware set delivers on all its promises and provides you with high-quality, durable cookware. Even if you aren’t satisfied with the set after a while, that’s totally fine because the set also comes with a Lifetime Warranty. This is one of the best stainless steel cookware set on the market. All the pieces of this set except the fry pans have this neat little detail: interior capacity markings. This makes it so much easier to measure the volume of your ingredients. These marks make the sometimes tedious task of making soup so much more convenient. The interior of all pieces is made of 18/8 stainless steel that is non-reactive. This is important when cooking with acidic food like tomatoes or anything with lemon juice or vinegar. The hard anodized exterior of this cooking set has the classic black color. The pieces in this set work very well with gas stoves due to the exterior being extremely durable and the four outer layers of aluminum assure even heat distribution when cooking. All of the pieces can handle oven, broiler and grill temperatures of up to 500. Yet another set that features a hard anodized surface. This makes it more durable than stainless steel, ideal for the wear and tear that a gas stove leaves on pans. My personal favorite part of this set is although it still follows the regular, classic black look of hard anodized exteriors, the black has a unique texture that allows the pieces to look simple and beautiful. The lids that come in this set are all made of tempered glass with a stainless steel rim and can withstand oven temperatures of up to 350, this set allows for so much versatility in the kitchen. The riveted handles of the pieces stay cool, allowing you to handle the piece without needing pot holders. The pieces are indeed dishwasher safe, however, hand-wash it is recommended. This isn’t much of a problem since the pan is non-stick making hand-washing the piece a breeze. The heavy gauge aluminum core of the pieces of this set are great for preventing hot spots that gas stoves cause. The set also includes a simple, yet flexible range. This set offers you some of the best value for your money. 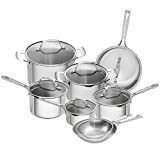 This set is relatively inexpensive, compared to some of the other sets on this list, and you get a 17-Piece Cookware set. While advertised as an Induction Cookware Set, the technology used in this set called Impact Bonded Technology makes the pieces in this set very durable making it great for any type of stove, even gas stoves. Impact Bonded technology used friction to create the bond between the base of the vessel and the disc. In the impact bonding machine, the disc and the vessel are placed where the machine uses friction to bond the two, the pressure created by machine can range anywhere from 800-1500 tons. This makes the pieces in the set very durable with an incredibly secure bond between the cooking disc and the base of the pot/pan. All of the pieces are made of 18/10 stainless steel, with all the lids being made of tempered glass, which makes watching your dish as you’re cooking a very easy task. This 17-piece set definitely ensures you have a set for all the kitchen needs you’ll ever have. Even if this set doesn’t live up to your expectations, the set comes with a Lifetime Limited Warranty. 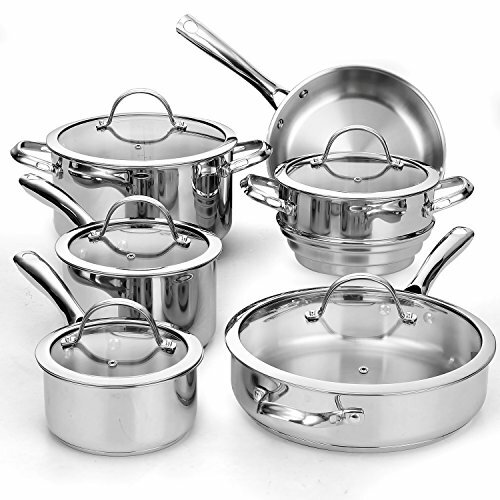 Yet another beautiful set of stainless steel cookware that has a Lifetime Warranty. However, the warranty will not be needed as this set does indeed satisfy, and also has great value for its price. Encapsulated within the stainless steel is an aluminum base with a copper core that ensures proper heat distribution which is perfect for gas stoves. You won’t have to deal with any more hotspots with the pieces in this set. Another great feature of this set is the riveted handles that allow the pieces to go from stovetop right into the oven. Within the pieces (except the fry pans) are indication marks that show the volume in the piece making measurements much easier. The tempered glass lids also allow you to check on the condition of your meal without losing all the precious steam and heat. The pieces in this set are all dishwasher safe and oven safe, being able to withstand temperatures of up to 550. Which of all these sets is the best cookware set for gas stoves? Well that answers is going to depend on the personal preference and the needs of the buyer. 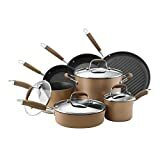 My favorite set of this list is definitely the GreenPan Rio set because it’s the one set of ceramic that I would use with a gas stove without worry about a possible discoloration or damage on the exterior. But if you want a heavy duty cookware set and you can afford the splurge, I would recommend you the Viking 5-ply cookware set. As I usually said, there is always a cookware set that fits your needs. I hope this list has been useful to you.